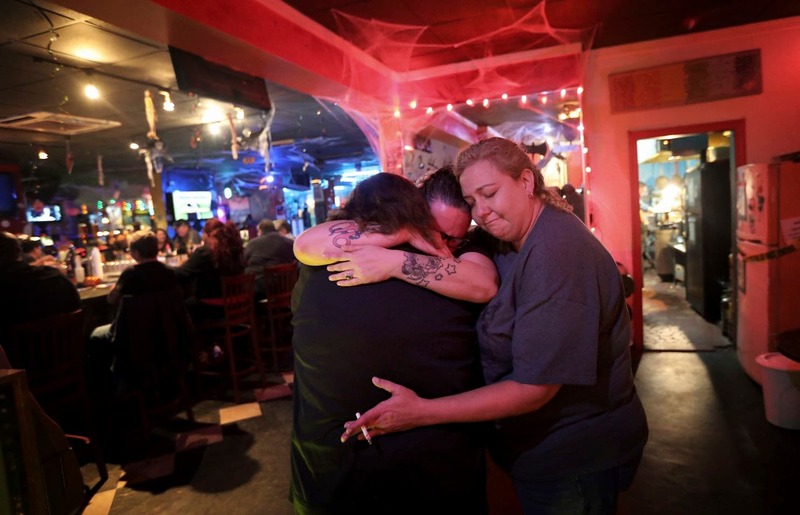 Patrons comfort one another on Oct. 31 as the Hershee Bar prepares to close. Two days before learning what would become of Norfolk’s embattled lesbian bar, a group of students and activists toured the city’s LGBTQ history. It was filled with graveyards — a hotel that used to be a gay bookstore, a parking garage where drag queens used to dance. When the group stopped at the Hershee Bar — Norfolk’s only dedicated space for bisexual, lesbian and queer-identifying women — the owners were packing up 35 years of history, piling it on tables around the bar. The last of its kind in Norfolk and one of the oldest lesbian bars on the East Coast, the Hershee Bar was shuttered Oct. 31 to make way for a planned revitalization of the Five Points corridor. Last week, activists who spent months trying to persuade Norfolk officials to save the bar learned what would replace it: A dog park. The announcement rattled those at a Norfolk City Council meeting who were prepared to continue lobbying city leaders for an alternative plan that didn’t involve razing the property. Several people cried. Council members and Norfolk Mayor Kenny Alexander (D) didn’t respond to requests for comment about the bar, the park or redevelopment plans. Activists who have lobbied them since June said they have been denied meetings with city officials. Until last week, they said, they didn’t know a plan was in the works. In February, council members unanimously voted to purchase for $1.5 million the four-building lot where the Hershee Bar had operated since 1983. There was no discussion about the potential impact on Norfolk’s LGBTQ community. There are three dog parks within three miles of the bar’s longtime home at 6107 Sewells Point Rd. On the LGBTQ history tour through Norfolk last week, the lost history was on display. Students from Old Dominion University and Virginia Wesleyan University were joined by activists, community members and historians. They wanted the same thing: to see where their history once stood — even if all that’s left is a vacant building or an empty lot. When they got to the Hershee Bar, the owners invited them inside. The place was dark and quiet. A heavy stillness hung in the air. The space, usually full of life, felt odd and eerie.